It’s hard to believe, after such a long gestation period, that The Dark Tower is actually being filmed. After more than ten years of plotting and scheming, the Stephen King adaption, starring Idris Elba as Roland Deschain and Matthew McConaughey as The Man in Black, is finally rolling – with set pictures to prove it no less. Recently, King also dropped a serious bombshell via Twitter, hinting that the upcoming Nickolaj Arcel film may be less an adaption and more a sequel. Twitter once again became the home for an update on the film, or more so, the book. While the image, posted by actor Elba, wasn’t quite as revealing as King’s teaser, it should give fans of the book series a thrill nonetheless. In the second line, the Star Trek Beyond actor states “I am Roland, son of Steven, son of Henry, true descendant of Arthur. And I have not forgotten.” As a descendant of an alternative version of King Arthur, The Gunslinger comes from a long lineage of lead-slinging heroes – sort of the Wild West extension of a questing knight. In effect, Elba is throwing his characters commitment to the cause out into the open. He won’t rest until The Man in Black is bested and the world set right. 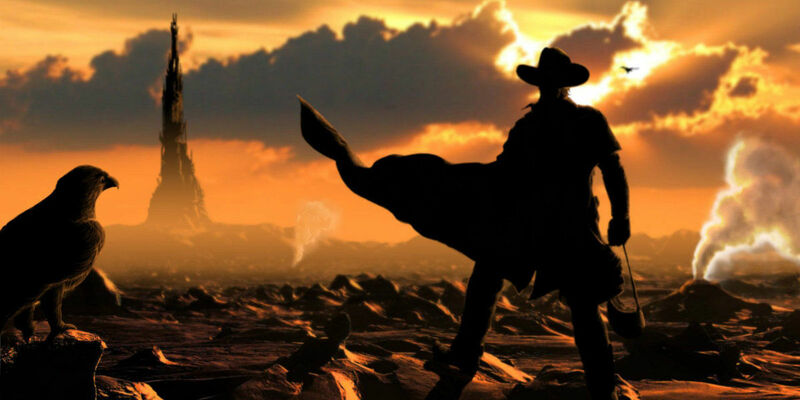 In the books, the time-bending quest of Roland Deschain takes him on a paradoxical course to save the Dark Tower from the Crimson King – who seeks to topple the edifice and destroy the multiverse. However, Deschain realizes, only at the end, that he’s undertaken the lifelong saga on numerous occasions and failed each time due to losing possession of the Horn of Eld. The reason King’s teaser is so potentially revealing is that, rather than questing time after time before discovering the key, he may already have the horn. The franchise-opening film could actually begin with the end The Gunslinger’s mission (confusing enough?). Creating a sequel of sorts instead of a direct adaption would explain the reported changes to the film’s story. However, King could be playing with Dark Tower fans as well. At this point, it’s unclear exactly which aspects of the overall story will enter into the likely first of many films, especially since King has admitted the first picture will start at both the beginning and middle of the saga. Assuming Arcel and the writers maintain the tone and story, it will be thrilling to see how the saga unfolds. The Dark Tower hits U.S. theaters on February 17, 2017.